So CCSS 3.NBT.A.3 states: Multiply one-digit whole numbers by multiples of 10 in the range 10–90 (e.g., 9 × 80, 5 × 60) using strategies based on place value and properties of operations. To visually show a problem, kids need to understand that multiplication is really about groups. In my card above you see that 3 x 6 is really 3 groups of 6 or you can show it as 6 groups of 3 also. 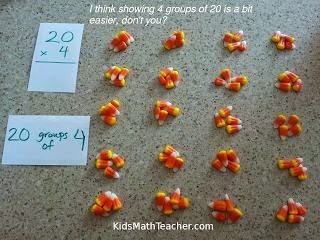 So, for my activity to do with this standard I put together a place value system with candy corn. In the ones place we have the individual candy corn, the tens place we have them in bundles of ten, then for the hundreds place we have a bowl of ten bundles. I could go on and make a thousands place which would probably be a basket to hold ten bowls. So, I did a sample problem 4 x 20. How many ways can we approach this? Some children might know how to do it on paper with 4 x 0 is 0 and 4 x 2 in the same column is 8, so it is 80 (but do they understand it conceptually?). Do they know they can represent it as 4 groups of 20 or 20 groups of 4. Of those two ways, which way is easier to show? Why? Most likely you will agree that 4 groups of 20 is easier to show. With the 20 groups of 4 it is there adds an additional setp to figure it out. 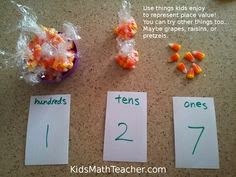 Multiply the array 4 x 5 and then multiply that by the pieces of candy. (4 x 5) x 4 still is 80. They just found the factors of 20. BTW, you can do this with other things if you don't have or want kids having candy: grapes, raisins, beans, beads, or something else. Do you ever use non-standard manipulative to do math in your class?